Despite the lowest mortgage rates of all-time, home buyers are slowing the pace at which they’re buying homes. According to the National Association of REALTORS®, on a seasonally-adjusted basis, the Pending Home Sales Index fell 1 percent in August. 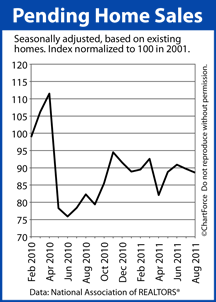 The Pending Home Sales Index measures homes under contract, but not yet sold, nationwide. In this respect, the Pending Home Sales Index is a forward-looking housing market indicator; a predictor of future home sales. It’s one of the few national indices that “looks ahead” to future market conditions. Most housing data, by contrast, describes past events. That said, even the value of regional data can be questioned. Like all things in real estate, the number of homes going under contract will vary on the local level. For example, in the Northeast Region where pending home sales slipped in August, there are close to a dozen states. Some of those states performed better than others, and there is no doubt that cities and towns exist in the region in which pending home sales actually climbed. As a national/regional report, the Pending Home Sales Index cannot show local market data and, for that reason, it’s somewhat irrelevant to everyday buyers and sellers. If you’re in the market to buy or sell a home today, it’s your local housing market data that matters to you. We watch the Pending Home Sales Index because it paints a broad picture of housing nationwide. To get local market conditions, though, you’ll want to talk with a local real estate professional.